Mist waffle iron with cooking spray. Combine wet ingredients, with the apple, in a different bowl. Then, add to the dry and stir until well combined. 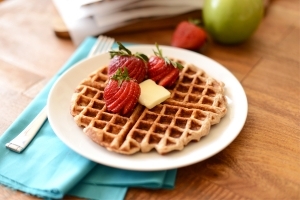 Pour over waffle iron until edges are crispy and brown. Serve topped with honey and fresh strawberries. Recipe by Brandi Koskie. Photo by Dana Shultz.